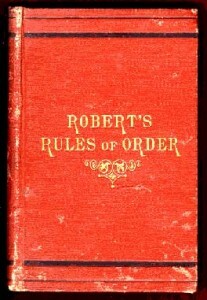 Open the unabridged Robert’s Rules of Order (RRO) and you might feel intimidated. With 75 sections and over 600 pages, it’s a monster. Written in the 1870s by a general named Henry Robert, it’s a time-tested tome of organization and efficiency. It’s kind of like the dictionary of meetings. But like a dictionary, you don’t have to memorize every definition to be conversant in this language of efficiency. Also like a dictionary, you’ll never use more that 10 or 20 percent of its contents, at least not to plan a fundraiser or review a mission statement. If you’ve ever had these problems in your club, a dose of RRO could be your ℞. If you’re starting a new club, a preemptive adoption of RRO can help you dodge the bullets above. You’d be surprised how a simple thing like voting can confuse an unprepared committee, or how circular and unproductive discussions can push active volunteers to quietly quit. So how can you learn about this “grammar of efficiency,” or explain it to your colleagues in a concise and approachable way? Many websites offer orientations on RRO. Many have paywalls, some do not. Googling “Robert’s Rules of Order” will give you more than you want to know, including a lot of irrelevant verbiage about corporations and church groups. Here’s what I think an average booster club will find useful (see a few more links at the end of this page as well). 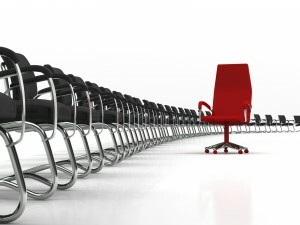 The only RRO info you will ever need: Called “How to Chair a Meeting” this guide explains RRO motions and procedures in just two pages (pages 10 and 11 of the pdf). In a friendly graphical format the remaining pages outline how meetings should be structured. Videos: sure the pamphlets are great, but when do people actually say these things? Robert’s Rules Simplified has short videos the help you practice making a motion, amending a motion, and a few other things. RRO, unabridged (a free, unabridged online edition): Like choosing a dictionary in a scrabble game, it’s important that everyone use the same one. It’s not so important that it’s up to date. Running a meeting with an RRO structure will make everything more clear. Motions clarify the process of proposals, and amendments allow members to thoroughly understand an idea before it’s voted on. Since you need at least one other person (a “second”) in order to discuss an idea, RRO reigns in ramblers, gossip, and other distractions. With a clear meeting structure (again, see that awesome pdf), chairpersons can efficiently guide members through minutes, reports, and new business. Once you get a sense of Robert’s Rules, you’ll notice that they don’t provide meetings with any character. As an ex-general and parliamentary rules geek, that wasn’t Robert’s strong suit. A final “extra-credit” step for any booster club adopting RRO is to include a bit of friendly ritual. For example, in 4-H, we used to recite the club’s motto. Or, like a club I recently visited, one could recite the pledge of allegiance. Another idea is to read out the mission statement (as long as it’s concise). Keep in mind that adopting RRO is not an all-or-nothing proposition. The rules contain many sub-points and bylaws designed to create an airtight structure of rules. With a friendly group of booster club board members, you won’t need to adopt every rule. You can agree on using the RRO jargon, and set meeting formats that fulfill your specific needs. I motion that you give Robert’s Rules a try. They’re easy to learn and they’ll really help structure your meetings. If you ever want to take a break from the parliamentary formality, you can always “move to suspend the rules.” Glancing at that handy pdf, I notice the motion requires a second as well as a two-thirds vote…. Does your booster club use Robert’s Rules of Order in their meetings? How does it help (or hurt) their decision making? Let me know.